Based on the material of Incises, a piece for solo piano, Sur Incises is a two-movement work for three pianos, three harps and three percussion parts, which use a variety of tuned percussion instruments: vibraphone, marimba, glockenspiel, steel drums, tubular bells, and crotales. 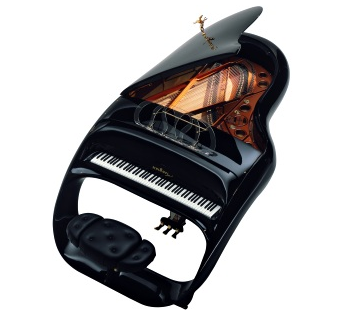 The sounds of the solo piano in Incises are broken into component parts played by the harps and percussion, and they are deployed across space by spreading the three groups apart in the performance area. This kind of reworking of an earlier piece is characteristic of Boulez. Sur Incises was awarded the Grawemeyer Award for Music Composition. David Robertson conducted the Ensemble InterContemporain in the world premiere of Sur Incises in Edinburgh’s Usher Hall on 30 August 1998. The sheer riot of color is engrossing. As the music unfolds, episodes of sustained, quasi-lyrical dreaminess alternate abruptly with outbursts of pulsating intensity that suggest “organized delirium”, in the term Mr. Boulez has used to describe an effect he is after in his works. When the performance ended … the audience erupted with its own brand of organized delirium. Perhaps after a couple of decades of neo-Romantic works by composers craving appreciation, the audience found it bracing to hear Mr. Boulez’s wildly colorful, almost crazed and uncompromisingly difficult music. [Boulez’s] choice of like but distinct instruments, with the percussionists playing vibraphones and marimba most of the time and the ensemble well spread out, allows him to use his astonishing ear to recreate effects of harmonic, timbral and spatial echo for which in earlier works he had needed electronic means. The command of musical energy and the sense of drama are also spectacular. At least the first two of the high-speed chases are thrilling, and there are marvelous moments when steel drums come in with their exotic disintonations, or when the harps fall silent for an ominous summons of pianos and bells. Claude Debussy’s Etudes are a set of 12 piano etudes composed in 1915. The pieces are extremely difficult to play, and Debussy described them as “a warning to pianists not to take up the musical profession unless they have remarkable hands”. They are broadly considered his late masterpieces.